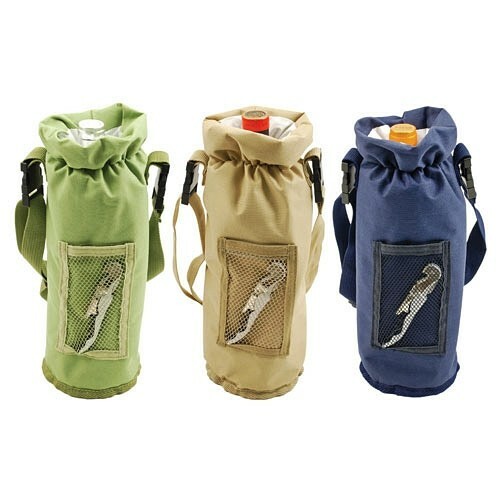 Dimensions: 14" x 5 3/4" x 6 3/4"
The Grab & Go™ Insulated Bottle Carrier keeps wine or champagne cool and protected for the journey and the included Truetap™ double-hinged corkscrew is at the ready when you reach your destination. Suddenly, the world is your tasting room. Made of insulated water-proof polyester. Includes a removable strap. Pictured wine bottle is not included. PLEASE NOTE: Sold individually (NOT as a trio). You may specify a preference for the color of the tote that you will receive, but the selection is RANDOM and is made at the time of order processing. If you order the bags in a multiple of three (3), you will receive one of each color (unless you specify otherwise).